“Be kind whenever possible. It is always possible” I learned only a couple of years ago that is a quote by the Dalai Lama. 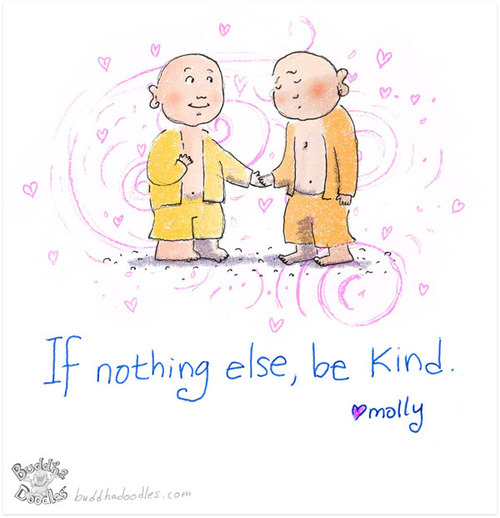 Kindness is something you’ve always encouraged in me, along with compassion, Mi. Even though we barely scraped through the month, you always assured me we were rich, because we had so much love to give and the unending ability to be kind. I’ve watched you give whatever you had without a second thought. As I grew up, though, I realized that happiness is not in material things. Happiness is in giving, loving, being kind. And always will be, no matter how much we covet things or pine after them. I’ve watched you help strangers without hesitation. If you saw a child hungry, you couldn’t bear it. You would gladly spend your last rupee making sure she was fed. You taught me to always be compassionate and never jump to conclusions about someone…who knows what their problem might have been? “Try walking in their shoes” you said. One of the things I follow devotedly is the wonderful habit you helped me cultivate at an early age – of giving. Remember how you always had a little giveaway bag ready to carry on your way out? We used to have such fun packing those extras. You made it a point to carry some food each time we went out, so we could distribute it to the children of the construction workers near our place. I continue to do it regularly. Oh, and those Thursday rituals! You never believed in religious rites. Instead, you insisted on feeding the poor. We would cook all morning to prepare those 100-odd food packets to give those handicapped street people who congregated outside the Sai Baba temple. Remember how Vidur once suggested, in winter, that the rice might be cold for them to eat…so why not give them a bun each? We immediately thought it was a good idea and started doing that. The other day, when I told him I feel like celebrating completing a particularly tough writing project, he said, “Mi, why not make sweets and take it across to Seva Sadan?” My eyes filled with tears. That’s what we did. You’ll be so happy to know that this year, just before school started, he packed up all his old school uniforms – you know how his stuff never looks old – and insisted we walk to the drop off point for RK Foundation. Inspired by him, I too did a quick clean up and together, the three of us carried quite a lot of stuff over. We walked back home feeling so light! He continued the good deed by packing up his old school books and distributing them at school. The next day, as I made a list of things to clear at home, Vidur suggested we create a corner in each room for the next one week and collect all the things we don’t use. At the end of the week, sort through in bags and give away. What a brilliant idea. We did it. I love how we have come a full circle. I learned to give from my Paati (Grandmother) and Vidur learned from you and me. I grew up hearing stories of generosity, honesty and kindness from you and my Paati, and we continued the tradition with Vidur, always telling him it was more important to do the right thing. I fondly remember how you would tell him every day, that honesty was the best policy. Today, Vidur knows that it is more important to be good, be kind, be honest and to be loved than be rich…to be known as a person with integrity. A few months ago, a classmate of his had a problem bringing lunch to school. Apparently his Mom was sick and his Dad had a tough time managing the kids. So Vidur told him that he would carry lunch for him as well until his Mother felt better. When he protested, Vidur assured him that his Mom (me) would be more than happy to send his lunch. I tell you, those two weeks we had such fun planning lunch and Vidur would take extra care to see that his friend’s lunch was nicely packed. I secretly blessed him every day! It also reminded me those days when I did the exact same thing for one of my classmates. Funny how life comes a full circle! My eyes filled with tears and I thought of you, Mi, when Vidur said, “When we are kind to people, our heart grows stronger“. Indeed. I know that in our house, none of us will hesitate to give what we have. My heart is warm when I think that we have made kindness a habit, compassion a way of life. My soul smiles. And I know that it is always up to us. Here is a beautiful poem I came across. Thank you for commenting! Hugs! This is such a heart warming post. Its really true that what is left of us is the kindness that we have shown towards people around us. People may or may not remember who rich or how successful you die but they will always remember your kindness to them. It gives me such a warm feeling in my heart to see how Vidur has learnt some great life lessons from you and your mom. Thanks! Thank you, Kajal! It is what I grew up with and oh, it feels very good! It is true that people remember kindness. I think we all should learn something from you! Seriously, One Life can make a difference…It is totally up to us! Loved the concept of Thursday ritual…Bless all of you! It is such an imp lesson…compassion and kindness. It surely makes your soul smile. I don’t do it that often…We have a family ritual…we feed the street children and the hungry on dates when my grandparents and my husbands’ grans left us for a better place…. I loved the post but mostly the story of Vidur’s kindness, Vidya. God bless him (and you!) for that! Thank you, Corinne. Vidur is such a gentle fella. What a moving post, Vidya! It’s so beautiful to see how we can pass along the qualities of love and compassion through generations rather than anger and aggression! Vidya, this is a beautiful post! I love that this love and compassion is being passed from generation to generation. Vodur sounds like such a beautiful soul! A very inspiring tale of a Mom and Son…It shows very well how much a Mom can inspire a child to do things right..Practicing what you preach is all that it takes..
Vidya ji wat an inspirational writing. Loved it.